Jug is an arcade adventure in which the player assumes the role of an interactive humanoid composed of titanium fleximetal and other organic materials; kind of like a cross between Robocop and a Transformer. Your mission as Jug is to seek out and destroy a deadly virus that is causing the brain within the living core of the planet Spiraeus to malfunction. The planet's immune system will attack and attempt to destroy you as if you are an infection. 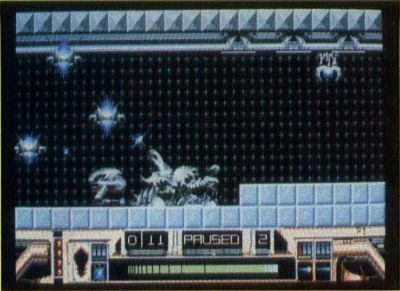 The action screen is made up of a foreground and background that are individually moved at slightly different speeds (parallax scrolling), effectively simulating a third dimension. 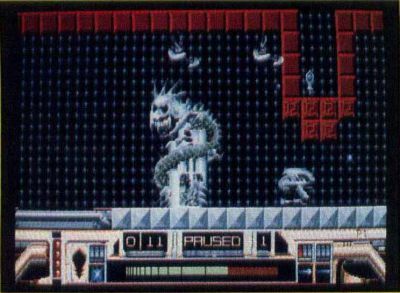 The foreground consists of multiple maze screens connected together by multidirectional scrolling and controlled by the movements of the Jug character. A joystick allows Jug to be moved left or right as he rolls along on wheels like R2D2 of Star Wars fame. To make him fly, the joystick is pushed forward. When a piece of equipment or a fuel pod is available, a pull on the stick collects it. The mouse is used only to select game options, which include a one- or two-player (alternating) contest and three difficulty levels. The planet Spiraeus is divided into zones representing gradual increases in difficulty. Allowing selection of an overall difficulty level is, therefore, a nice feature that allows a more experienced player to begin at a higher level instead of having to fight his way from the beginning. There are a number of weapons systems available that Jug can store and use on demand. These include high-energy plasma bolts, high-speed laser beams and Zeo-quark particle emitters (smart bombs). Teleporters are two-way devices that can be used to instantaneously beam out of a dangerous section of the planet. The status display at the bottom of the screen contains indicators that, when lit, register the level of damage sustained as well as the amount of available fuel and weapons systems stores. In order to move from zone to zone, a "sector key" must be found. These devices, when installed in Jug, have the ability to dissolve solid walls. Also, certain areas of the planet are contaminated with radiation, and travel within them drains fuel supplies at a greater rate. Jug's graphics are finely detailed; several shades of a color are used to give a feeling of depth and roundness. Every sprite is really a work of video art and many are uniquely animated. Also, it's nice to see the effort made to provide such a wide variety of on-screen antagonists. MicroDeal has addressed at least one misgiving about several previous titles: the lack of a music toggle. In Jug, F7 allows just the volume of the music to be decreased, while F8 serves to increase it. All in all, Jug is one heckuva good play! 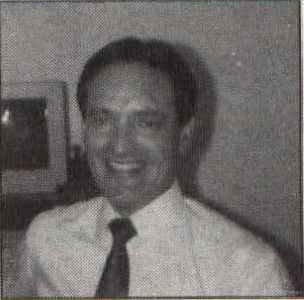 Frank Eva is an auditor by profession, but has been involved in the computer industry ever since his purchase of an Atari 400 many years ago. He has dabbled in programming and has had several text adventures published.